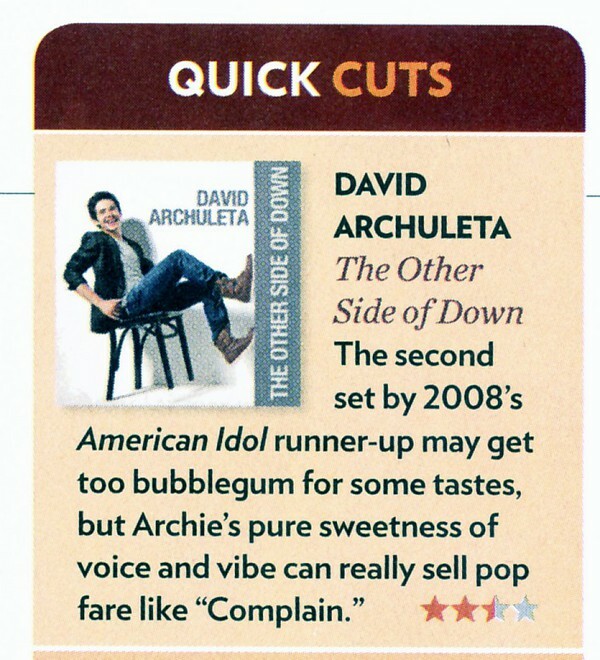 I have learned that reading David Archuleta album reviews can be bad for my heart. They are sometimes spot on, sometimes brutal, always opinionated, and most definitely more about readership or website “hits” than music appreciation. Ultimate goal: To rile people (me) up and get us (me) all defensive. I even wonder sometimes if the “reviewer” has actually listened to the CD or has just based their “critique” on the song titles alone — or simply biased their review based on personal opinion and preconceived notions about David. I must remember that everyone is entitled to their own opinion, right? So, “The Other Side of Down” reviews that were particularly negative, I ignored. As a result, I ended up archiving the ones with mostly positive vibes. And of those, what I found most interesting was the range of songs that were highlighted as stand-outs. SBL and Elevator are mentioned often; perhaps because, as singles, they have been heard more than once. BUT, check this out – EVERY song on David’s album is listed at least once. This is amazing to me. Well, not to me personally as there is nothing of David’s that I can really say I don’t like, but in the general sense that when I buy an album it is usually for one or two, and at most a few, songs. Why is this? To me there seems to be a wonderful variety of different sounds /sound effects / musical variations in melody to keep my interest throughout the album and perhaps someone with a musical ear can further define this for me. Regardless, I would say that this is quite an impressive feat. Congratulations, David and kudos to you on a winner of an album! And, if anyone is interested in my favourites, with no song on the album being one that I skip over (save SBL occasionally – just because I listened to it so much when it first came out): MKOP is my “heart” song, as someone labeled it, with Good Place and PandA right up there as well. How do you feel about reviews? 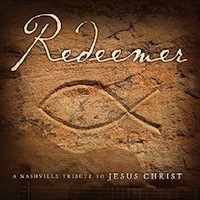 Why hasn’t the New York Times or Rolling Stone reviewed the CD yet? Or is that a good thing? Do you agree with the critics’ picks of “stand out” songs? P.P.S. Here is Embe’s beautiful cover of “My Kind of Perfect” … enjoy! P.P.S.S. 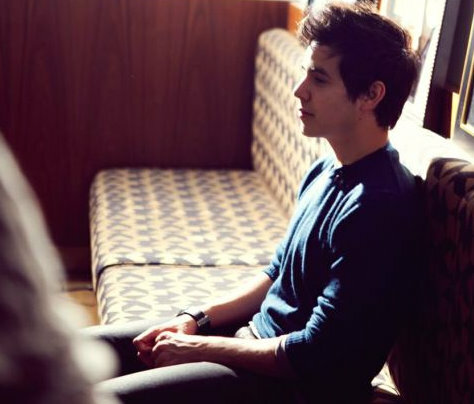 AOL.com’s “A Day in the Life of David Archuleta” video (on YouTube thanks to JackRyan4DA 🙂 ) with original full PopEater article HERE. 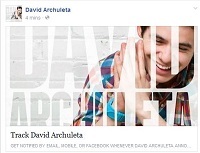 This entry was posted in Music review and tagged David Archuleta = Xtraordinary. Bookmark the permalink. awestruck, i noticed that too… that each reviewer had a different song that appealed to them, wayyy cool. btw, the other thing that i noticed on the negative reviews that there was never a song-by-song review; most often, it was a paragraph or two condemning the genre of music, and never his voice. 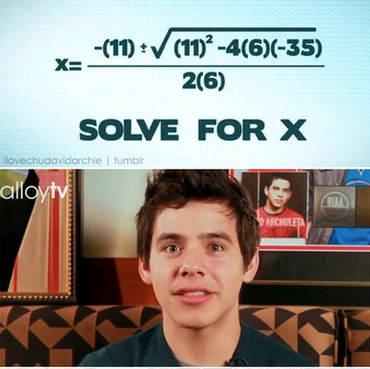 nesquicus has posted the answer to the math equation of twitter, lol. Great post, awestruck, really cool to see a tally of the songs that were singled out by reviewers (esp. since my fave tops the list, lol). I appreciated the reviews (even if they weren’t total raves) that assessed the album on its own merits … what did the artist set out to do & were they successful? … and the ones that tried to make some insights into themes etc. (EW, surprisingly enough). Embe, your MKOP is beautiful!!!! You should cover it with your band for youTube!!! awestruck – (Giving you the horror look!) Math is life. Math stays with us everyday it is just that we are not that conscious about it! OK, that’s the “sermon” that I give my kids & my siblings whenever we have lessons, LOL. “Math is life” is actually a tagline that we have adopted. janey – yeah, those with just negative comments could not, in all honesty, say anything about David’s voice could they now. Think I fixed Embe’s audio clip … please let me know if it still doesn’t work for you guys. there you go Nita, a positive way to look at it. Which review was that in? I completely missed reading that comment. I saw it from the costumers review in itune. TOfan – windows media player still does not recognize embe’s MKOP. TOfan (I am assuming that was you), you are genius. ps: I don’t know the program cos I practically don’t watch TV for some time now. BTW, I had problems playing EMBE’s MKOP from the link above. When I downloaded it, it was just showing 326kb… probably the format. EMBE – you should submit this to David. Dang! Too bad the myspace contest thingy is not available in your parts. Perhaps those of you the US can still submit it? Is it still on? JR, that vid is awesome!!! 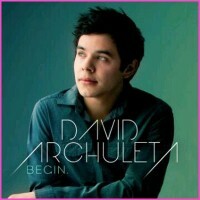 I saw a rumour on Twitter that David will be performing in Manila again sometime in 2011 … I can certainly see why, wow!!! & thanks for the upload of Embe’s MKOP, thanks to you, I think the embedded clip at the end of the post might actually work now *fingers crossed*. And EMBE – I twitted the file to David and Melinda. David may not see my twit among the gazillions he receivex daily but Melinda sure will. JR – I had forgotten it was YOU who said ‘heart song’ – that really fits for me! As for math, I know, I know I use it EVERY day, just not to the tune of figuring out equations like at the top of this! TOFAN – Yes, there is unconfirmed news that David will be coming to Manila early next year. That would mean an Asian Tour. But the better news is that it will NOT be under the producer who originally brought them here! I know he is coming. He said so himself. Just waiting for confirmation from our local Sony unit. But the part that it won’t be under Fearless Prod is the best part cos that means we will have a shot at a legitimate M&G! me too!!! you must have a M&G!!! Just want to drop by and tell Embe how much I loved her cover of MKOP. Nice work and you have a lovely voice there, missy. Hello at last to all my SnowAngelz and to TOfan and Refnaf who I left in Cleveland and still feel you with me somehow. Crazy how close the connection can form among David fans. Really hope we can meet again for a David concert soon. Can you come down south this time? haha. YJ from Cleveland actually vows to come to Baton Rouge if he ever tours there. Love your recaps TOfan and sorry I have been lax in posting but came down with a chest cold after getting home that has had me kind of exhausted but much better now. (((hug))) to you and Refnaf and all my Canuckie buds. <sp? I love that you put all the reviews in one neat collection. You may want to include the not so positive ones as well — as souvenirs! LOL. And I quite agree that it is interesting that each review would have different stand out tracks for them. Just shows the wide range of appeal TOSOD has. Come on Jive, show some muscle and push this album! Awestruck, I love the theme of this article, though I hate math 😛 I’ve given up on seeing reviewers as people whose opinion matters. It doesn’t. Not in today’s music world. Years ago critics actually had something useful and constructive to say, and they weren’t so biased. Now a reviewer’s take on an album is like asking my dog what he thinks of today’s society. The difference being, of course, that my dog is smart and his opinion matters. JR, you vicious woman you. You sent my MKOP cover to Snarky Archies?!?! AND you TWEETED Melinda AND David about it?!?! Geez, I can’t even keep up! I didn’t send it to Snarkies, HONEST! I promise. I know that 6 seconds is nothing but 6 seconds of David? Well, I found out additional footage from the Wendy Williams Show, so if anyone is interested..
Awestruck, great post! I confess to being a review virgin. Not only do I not care to much what others are saying, but I want my limited on-line time to be wisely spent, plus like you if I read somethong negative, it hurts. It is interesting to see the different standouts> “EVERY song on David’s album is listed at least once” and that does say that this cd is a great mix of great songs. Embe!!! you can sing it girl!!!!! @aolmusic: Re: Lots of questions about the last tweet. Just keep an eye on @aolmusic today! And in the article, when the writer says David “instantly changed the vibe of the room” when he “strolled into the Jive studios,” I had to LOL that there was no need for a description of how it changed … we all know exactly how … where David goes, joy follows. How he can embody the innocence of Nemo one minute and the wisdom of Yoda the next never ceases to amaze me. So that would mean David’s Yomo or Neda? Love your imagination TOfan. 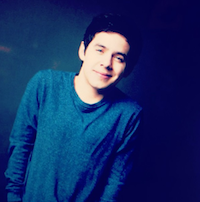 “Here are some photos I shot for A Day in the Life: David Archuleta for PopEater. This was a great shoot – he is such a positive, talented young musician, and his energy and love for his work is infectious. We started the day at Jive Records, where he signed lots of copies of his new album, The Other Side of Down. We then documented the rest of his day, recording liners, doing interviews for Alloy.com, checking out his new “Archie App”, interviews with Associated Press, MTV (10 on Top and and MTV News with Jim Cantiello), and more. It was a blast getting to know him, and I can’t wait to see what he does next. You can check out the video documentary I shot, below. Cos he is an aliiiiiiiiiiiiiiiiiiiiiieeeeeeeeeeeeeeeeen TOFan. That’s the only logical explanation. So what the heck am I doing still up at 3:45AM, watching this vid and reading the article over and over again?! And to think I haven’t experienced watching him sing up close like you guys did?! I feel you JR and TOfan. I’ve been late for work about 27 times because I’ve been reading through all the David fansites and watching his videos. Is that sane? I think not. But I couldn’t be considered sane regardless, so. JR – your unrestricted enthusiasm is contagious I ‘heart’ you! Loved the day in the life of David video! I’m super busy with school but I saw it was less than 3 minutes so I was like “why not?”. A lot to catch up on for me still, been busy with good friends from out of town. Embe…..did get to listen to your cover of MKOP and have to say…what a lovely voice you have! “Cos he is an aliiiiiiiiiiiiiiiiiiiiiieeeeeeeeeeeeeeeeen TOFan. That’s the only logical explanation. (((((JR))))), perhaps a 12 step program for archuholics is needful, not that any of us want to be “helped”, lol. I am glad that you are always up…. and finding us vids and converting them etc…. so you can view your ODD as helping the needy!! Tonight is another live performance!!! Excited, maybe he’ll do something new off the album??? Yay!!!!!!!!!!!!!!!!!!!! Took long enough! Seriously! TOfan, has yours come yet??? Refnaf – are you ok? Are your paddles on stand by? Pls come back to us so we know if you need intervention. Seeing David on the bigger screen was awesome, but I thought there was some new stuff on the DVD… so I was just a smidge disappointed, lol, no intervention needed, maybe after tonights gig. You know when you love a song so much you have to listen to it on full blast, even though it hurts your ears a bit… and you still feel like it’s not loud enough, like you want to hear every little detail and maybe even a breath intake here or there, just to feel the singer caressing the song into life..
And then you just get lost in the song, like you had dived into water, and it’s kind of surrounding you and the water flows into your eyes and ears and nose and your every sense comes alive just for that song, that sound, and you feel the music like you feel the blood in your veins..
and when the song stops you feel like something’s missing… so you need to play the song again… and even though you know exactly how the song goes, you know it by heart, you still get chills everytime you listen to it. That’s why I love David. I get lost in him everyday and I don’t want to find a way out. Ever. … and I haven’t played the DVD, isn’t it the same behind-the-scenes video we got with iTunes??? Aangels from last night, performed at the Altar Bar! Was super excited when I got home last night to see that he'd sung it. Happier to watch the video this morning. 😀 I will never ever ever get sick of hearing him sing that song. “Angels” from last night was one of the best performances of David so far. It’s so simple yet so powerful. And to look at the emotion in his face and hear his heart spilling out …..no words can capture it. love it! love it! thanks for posting! Aw, what a treat to have videos of David’s wonderful performances last night. Angels…just gorgeous, stunning….always been one of my favorites by David. Like refnaf said…one of my “lift me up” songs, definitely for me too. I would love to hear David sing that song live one day, would just love it. All his songs were wonderful & My Hands…fabulous! Glad that everyone has now received their fan packs, or so it seems! Guess I was lucky, got mine on the 5th. Seems to be a lot of talk out there about David doing an Asian tour next year, would be wonderful for the fans there. Let’s hope they remember that Canada is still waiting in great anticipation too! Thanks for the videos, great way to start my day! Ref & awestruck, thanks for the vids, I haven’t been able to watch till now (torture!) … oh my … Angels *speechless* … My Hands, fell in love with it all over again. 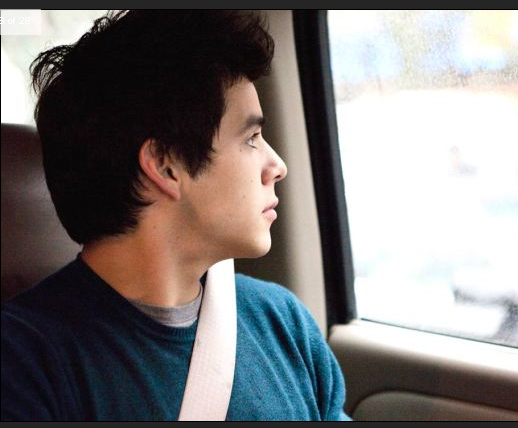 Should @davidarchie and I do another ustream from our nations capital this week? Of course on the last chat I kind of felt like an old fan amongst 1598 teens, haha. Still enjoyed it though!